The location of PachaMama is off the beaten track, wild and rugged with forested hills and abundant natural life. This scenery just by its own nature provokes and inspires, making PachaMama one of the most ideal places to retreat in Costa Rica, allowing a much needed pause from the normal activities of daily life. Living and working in the cities takes its toll, PachaMama is built on 220 hectares giving a feeling of spaciousness, the set up has been carefully planned so the buildings are surrounded by and look out on forest and tropical plants, some of the accommodations have sea views, further enhancing the retreat atmosphere. There are several Costa Rica retreats available, each with their own uniqueness, however PachaMama has a simpler style than other retreat centers in Costa Rica and to that matter, than other retreats centers in the world, in that the retreats are taking place in a community of likeminded people, who have lived here for some years and who maintain a daily group meditation, and a healthy lifestyle. PachaMama serves deliciously prepared vegetarian food, and offers nourishing goodies. This is a good opportunity to give the body a break from coffee, smoking and other damaging habits. 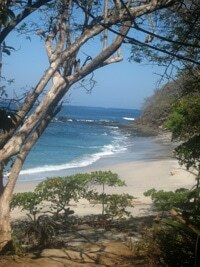 PachaMama holds several kinds of retreats, silent retreats, cleanse retreats and yoga retreats as well as self retreats. Each of the retreats stand alone but the combination of them which takes place in PachaMamas transformation cycle is a unique opportunity for a life-changing experience. Treating oneself to a colon cleanse and liver flush can help to jump start the body into a more wholesome eating routine, the restaurant and wild treats help to support the cleansing process and transition to healthier eating. A cleanse retreat is offered as a group schedule or alternatively privately if the timing is not right. The meditative atmosphere in PachaMama during meditation retreats, gives a feeling of being supported and held both physically and emotionally, creating a space to totally relax and not have to worry about preparing meals or other duties that occupy time in daily life. These silent retreats take place three times a year. There are several therapists, whom have a great deal of experience, and offer sessions on a daily basis, these sessions can be really supportive for any process that is happening on a physical and emotional level, one can touch vulnerable spaces very quickly here, and these body workers are sensitive to these conditions. Mind and body retreats are offered here in PachaMama, with daily yoga and other therapeutic workshops, self retreats are especially done during the rainy season; it is during this time that there is the opportunity to dive into aloneness surrounded by the peaceful and comforting sound of the rain, and the vibrant green of the forest, while at the same time being able to join the daily meditations.